The MagSafe adapter in MacBooks and MacBook Pros is probably the greatest single advancement in laptop technology in the last 10 years. Interestingly, the MagSafe port is also a an analog volt meter that can be read by the OS, and it’s not just limited to monitoring battery voltage; with the right software, you can turn a MagSafe port into a terrible and expensive analog sensor, letting scripts on the computer run based on analog values. [Peter] created a voltmeter application for his mac after realizing the System Management Controller – the chip responsible for charging the battery – was accessible through low-level kernel calls. If you care enough to chop an Apple power adapter in half, the MagSafe port can read other analog inputs. The SMC Voltmeter app [Peter] wrote samples the voltage every second and displays values on a graph. This app also allows you to run scripts. While you won’t be able to do much with an extremely expensive, very slow, one-channel data logger (the battery is going to run down eventually), we’re sure we’ll see something that’s held together with duct tape and prayer that uses this weird tool. The MagSafe power connector for Apple MacBooks is probably one of the handiest features they developed — we’re not too sure why it hasn’t been integrated onto iPhones yet. [Tony Hoang] isn’t sure either, but that didn’t stop him making his very own! Due to the size of the MagSafe adapter, it’s simply not possible to integrate it directly into an iPhone, so [Tony] took his trusty Otter-box case and modified it instead. He’s using a Qi wireless charging receiver on the inside of the case, because it has a very slim ribbon cable to the USB. Modifying that he was able to solder on the MagSafe adapter directly to the ribbon cable. In order for it to fit nicely through the case, he 3D printed an adapter bracket for it to stay nice and secure. From there it was just a matter of soldering the MagSafe power cable onto a 5V USB power brick, and boom-bada-bing, he’s got a MagSafe compatible iPhone. Previously he’s done this mod to a Samsung Note II, and plenty of other people have added it to laptops and ultrabooks! We’re thinking most Hackaday readers have at one time or another been tasked with replacing the power connector in a laptop. Anyone who has done so can easily see the genius behind the Apple Magsafe connector. Since the second gen iPhone, there have been rumors Apple will release a cellphone with the Magsafe connector, a great idea, seeing as how cell phones are thrown around even more than laptops. [Tony] got tired of waiting, and had an Android device anyway, so he decided to retrofit a Magsafe power adapter to his Note II. In the interest of excess, [Tony] is using the absurdly large ZeroLemon 9300mAh battery and case for his device, giving him a lot of room for this hardware mod. A tiny 3D printed adapter fits around a slightly modified Magsafe connector, and with a little bit of super glue and solder, the connector is wired up to the charging port. Of course the charger isn’t a stock Apple power supply; it’s just another Magsafe plug wired into a 5V wall wart. We’re not going to take a guess at what would happen if [Tony] plugged a stock Apple charger into his modded phone, but the mod works perfectly without the danger of ripping a USB port out of his phone. Something’s fishy about the above-pictured ultrabook: it’s an Asus Zenbook that [WarriorRocker] hacked to use a MagSafe power connector typically found on Macbooks. Most of us probably consider it standard procedure to poke around inside our desktop’s tower, but it takes some guts to radically alter such a shiny new ultrabook. 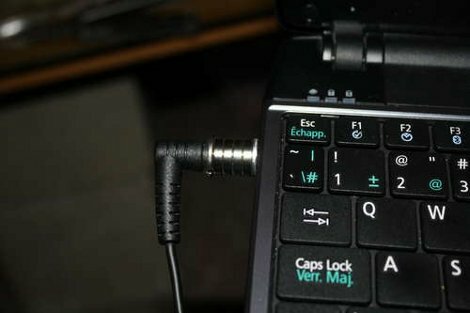 It seems, however, that the Zenbook’s tiny power plug causes serious frustrations, and [WarriorRocker] was tired of dealing with them. Using information he found from an article we featured earlier this summer on a MagSafe teardown, [WarriorRocker] hit up the parts drawer for some connectors and got to work. He had to modify the MagSafe’s housing to fit his Zenbook while still holding on to the magnets, but he managed to avoid modifying the ultrabook’s case—the connector is approximately the same size as a USB port. Deciding he could live with just one USB connection, [WarriorRocker] took to the board with a pair of side cutters and neatly carved out space for the MagSafe next to the audio jack. He then soldered it in place and ran wires from the VCC and Ground pins along a the channel where the WiFi antenna is routed, connecting them to the original power jack’s input pins. [WarriorRocker] regrets that he fell short of his original goal of getting the MagSafe’s protocol working: he instead had to hack on his own adapter. We’re still rather impressed with how well his hack turned out, and it did manage to solve the charging problems. Hit us up in the comments if you can provide some insight into the MagSafe’s otherwise obscure innerworkings. [Tommy Ward] had a big problem with the cord for his laptop power supply. This thing’s not cheap so he figured out a way to fix the frayed cord on his Apple MagSafe. He asserts that the shortened rubber collar on the plug end of the cord is to blame for this type of damage. We think rough use may have something to do with it too, but having had to repair our own feline-damaged power cords we’re not about to start pointing fingers. To pull off an appropriate fix [Tommy] pries apart the case housing the power converter. This lets him get at the solder connections of the cord. After removing it from the circuit board he clips off the damaged portion of the cable. To reuse the strain relief grommet he drilled out the old portion of wire and insulation, making room for the undamaged cable to pass through, adding a cable tie on the inside to aide in strain relief. The last part of the fix involves gluing everything back together. If your power supply problems have to do with the computer connector itself there’s a fix for that too. [Freeload] sent us his custom MagSafe adapter build for laptops. MagSafe for those unaware is Apples (patented) power adapters that prevent damage to laptops when the cord is accidentally yanked from the socket. While we’ve seen some custom versions before of MagSafes they were usually bulky, ugly, and used a ton of unremovable glue. We really like [Freeload’s] because its quick, good looking, and the best part – completely removable without marks or damage. In short, an easy weekend project that could one day save your laptop.